days and nights for more playtime with your pets! - Easy to clean, just wipe the dirt off with wet towel and let dry. - Good for any breed, and even smaller animals like cats or rabbits, with a variety of sizes available. - Chic and upscale design at a great affordable price. 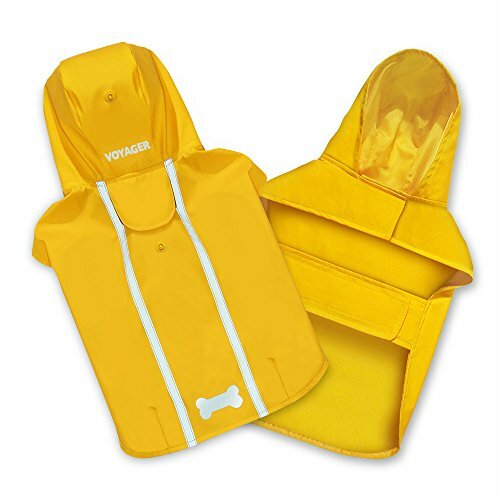 - Voyager branded products by Best Pet Supplies are the industry’s leading bestsellers across several categories, so you can buy with confidence in the quality and usefulness of anything we offer, including our wet weather apparel for your canine and feline companions. poncho for dogs. Click ‘Add to Cart’ now! STAY SAFE THE SMART WAY: Thoughtfully-placed reflective safety stripes help you and your animal loved ones walk with confidence in dim lighting conditions. Yellow color also helps grab attention! HANDY FEATURES: A smart flap over the leash-access opening further keeps out the elements, while the hood can be conveniently buttoned backwards for when the sun comes out again!